Laura Quinney. William Blake on Self and Soul. Cambridge, MA: Harvard University Press, 2009. 216 pp. $42.00/£31.95, hardcover. Tristanne Connolly (tristanne.connolly@uwaterloo.ca) is associate professor in the English Department of St. Jerome’s University in the University of Waterloo. She is the author of William Blake and the Body (2002), and co-editor of the essay collections Queer Blake (2010) with Helen P. Bruder and Blake 2.0: William Blake in Twentieth-Century Art, Music and Culture (forthcoming) with Steve Clark and Jason Whittaker. 1 William Blake on Self and Soul discusses fundamentally interesting topics: Blake’s relation to empiricism and Gnosticism, and his struggle with existential alienation. But the book applies a preconceived framework to his poetry, and this has an unfortunate steamroller effect: it flattens out the texts in its path and moves straight ahead, passing by much that would be helpful, and even necessary, to its purpose. 2 To summarize the framework: “the essential uneasiness of consciousness” (85) is exacerbated by empiricism, a “Science [of] Despair” (Milton 41.15, E 142) that renders the self “intangible” and the world “real” (12). The soul’s intuition of its “transcendental provenance” (xiii), discounted by empiricism, is experientially true, for Blake and all human beings. For remedy, Blake pursues Neoplatonism and Gnosticism, but with a twist, rejecting the individual immortal soul in favor of “the Human Imagination” and the afterlife in favor of “the Eternal Now” (21). He describes the problem in the early illuminated books, then develops his solution, which leads from personal agency in The Four Zoas to individual reformation in Milton and ultimately to self-sacrifice in Jerusalem. 3 The emphasis on the value of experience as a touchstone for theory and interpretation is salutary, but I wish that Quinney had explored ways to ground this principle methodologically. Phenomenology would be an obvious resource. Sensibility, with its connections to empiricism, would make an ideal context for both the prizing and the suspicion of the inner life and its pains as an index of authenticity and route to salvation. Biography could be employed to consider Blake’s own understanding of a basic and universal existential bewilderment. This last Quinney nods to occasionally; for instance, she considers Blake’s “indenturing himself to the dreadful poetaster Hayley of Felpham” as his own “delinquency of Imagination,” making “Blake’s critique of Milton” also a “cryptic self-reproach” (134). Such a judgmental view seems unfair to both Hayley and Blake in light of Mark Crosby’s work  and, less recently, the detailed and balanced picture of the relationship in G. E. Bentley, Jr.’s The Stranger from Paradise (2001) where, though the tensions are evident, “Hayley’s loyalty to Blake persisted even in the most trying circumstances”—in his financial and moral support throughout Blake’s prosecution for sedition—“and Blake continued to serve Hayley energetically long after he had left Hayley’s direct patronage” (Bentley 234). Looking more closely at the complexities of the friendship would not only have been more accurate, but also might have helped to develop a parallel between imagination under patronage and consciousness under material constraints. 4 Without an explicit effort to locate the experience of “the actual subject” as opposed to the fabled unitary one (2), differentiating between authentic and pernicious representations becomes arbitrary, or generically prejudiced. Locke “has no theory of the self and gives no representation of the inner life. But Wordsworth, who put the empiricist metaphors into play, wrote the autobiography of Lockean subject [sic] in his poems of the 1790s” (69). When Wordsworth does it, it is pathos (and even Blake, Quinney argues, is sympathetic in his critique); when Locke does it, it is not a moving description of the alienated soul but its cruel condemnation to a “dark box” (85). Quinney’s brief discussion of Locke’s theory of the self (which he does indeed have, coining the term “personal identity” in An Essay Concerning Human Understanding) dwells on the impossibility of complete self-knowledge and sees Locke’s call for self-examination as self-objectification, rather than a view of the inner life, or an attempt to let some light into the existential darkness (44-45). Strangely, she perceives no struggle in Locke: personal identity is simply “continuity of memory” (169), regardless of all the puzzles and qualifications that lead him to this position, which remains problematic in the end (Locke is not only anxious about forgetfulness, but also remarks that his theory would allow for multiple persons in one spirit or body, and vice versa; see, for instance, 2.27.22-23). Locke hardly “missed” the “subtlety” (78) that past and present selves are both linked and alienated. 5 Even if Quinney sticks to the old Frye line of Blake against empiricism, she could strengthen her position by arguing with other scholarship beyond one footnote simply asking the reader to “compare” with an opposing view from Steve Clark (179). Another footnote directs the reader to “recent” studies on Wordsworth and empiricism from 1989 and 1991 (180); there are four pieces of post-2000 Blake criticism in the bibliography. Reference would be enriching, for instance, to Matthew Green’s Visionary Materialism in the Early Works of William Blake: The Intersection of Enthusiasm and Empiricism (2005), and, within the bibliography’s time zone, Wayne Glausser’s Locke and Blake: A Conversation across the Eighteenth Century (1998) (which also sees a therapeutic motivation in Blake’s work, and Locke’s). Kevin Hutchings’s Imagining Nature: Blake’s Environmental Poetics (2002) would be useful at moments like this: “Everyone knows that Blake is a species of Platonic idealist, championing Imagination over Nature, and the transcendent realm over the world of matter” (99). Quinney pronounces Blake “an atheist and an unbeliever” and ironizes any contrary evidence: “he flaunted his secular religiousness deliberately by constantly writing of God and Christ” (26). Even Martin Priestman’s Romantic Atheism: Poetry and Freethought, 1780-1830 (1999) does not claim atheism for Blake; his careful examination would be another profitable addition to the works cited. 6 Tracing Blake’s response to Gnosticism is challenging because his sources would have been largely secondary: histories of heresies with an orthodox or unorthodox axe to grind. Quinney relies on Hans Jonas’s definitive work, but he has the benefit of material that long postdates Blake, such as the Nag Hammadi library, unearthed in the mid-twentieth century. Quinney states that she is not source-hunting; fair enough, but she does not find an alternative way to maintain precision. She appeals to E. P. Thompson on the “Gnostic lineage” of “popular religious movements” that influenced Blake, and declares, “That is good enough for me,” with only a cursory acknowledgement of the Moravian discoveries which displace Thompson’s theories (55-56). She goes on to say, “I would simply like to name as ‘Gnostic’ the kernel of religious humanism in all the religions in which he participated sympathetically” (56). Clearly, this dilutes “Gnostic” to near meaninglessness. She does qualify that “religious humanism” here indicates treating the human as the divine, but the following paragraphs show how Blake “jettisons Gnosticism’s proliferation of divine beings including the enigmatic Unknown God” (57): that is, how Gnosticism fails to treat the human as divine. 7 Blake’s own mythic beings are interpreted in anthology footnote style: for instance, Ololon “represents” Milton’s “Emanation” and also his “actual wives and daughters” (166-67) and is assumed to be uncomplicatedly female. Yet Quinney’s comparison of Oothoon to Sophia (46) is a sharp point, and she builds upon it to argue for a strong role for Emanations: they are the ones who “awak[e] from the stupor of materialism,” recognize “Eternal Life,” and feel pity for “the spectrous dead” (93). The “Emanations represent the perception that their Zoa refuses”; they fulfill a Cassandra-like prophetic function (106). Though this does not place the Emanations in an enviable position—portions of other beings, their insights ignored, left to lament—it does endow them, particularly, with soul-saving perception, compassion, and resistance. One moment which captures Blake’s own perceptive sympathy is a consideration of “The Smile” as a microcosm of a “typically Blakean … movement of affect.” Though it is painting with too broad a brush to claim that “each of the Epic Prophecies as a whole moves this way,” the pattern that Quinney describes is evocative: there is “a gripping … account of suffering,” then “the ray of light, when it comes, is invested with all the pathos of remission” (88). 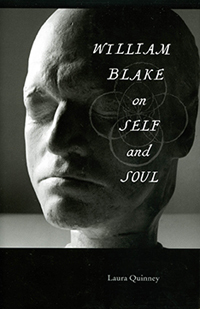 8 It is regrettable that Quinney’s emphasis on authentic experience of the self leads her away from adequate research and precise reading, marring the potential to delineate Blake’s compassion for the wandering soul and stir sympathetic echoes in readers. 1. Such as Jon Mee and Mark Crosby, “‘This Soldierlike Danger’: The Trial of William Blake for Sedition,” Resisting Napoleon: The British Response to the Threat of Invasion, 1797-1815, ed. Mark Philp (Aldershot: Ashgate, 2006), which suggests a Hayley who defends radicalism, both Blake’s and Milton’s.